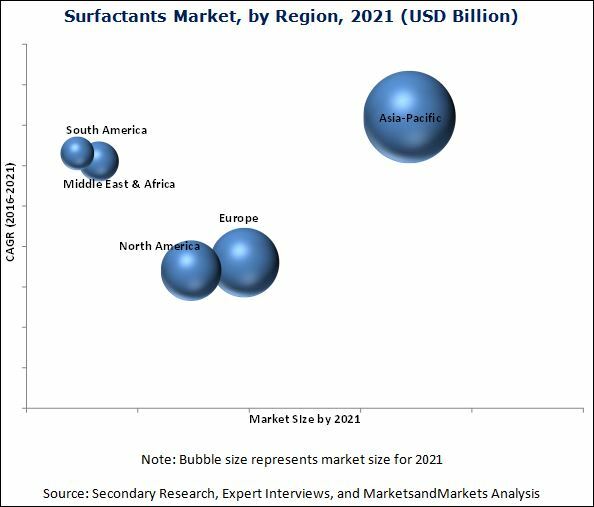 [168 Pages Report] The surfactants market size is estimated to be USD 30.64 billion in 2016 and is projected to reach USD 39.86 billion by 2021, registering a CAGR of 5.4% between 2016 and 2021. In this report, 2015 is considered as the base year and the forecast period is between 2016 and 2021. Surfactants are surface active agents that reduce surface tension of liquid. It helps in increasing the wetting properties of the liquid. Surfactants are mainly used to separate dirt, oil, and stains from various surfaces. They are important ingredients in soaps, detergents, cosmetics, personal care products (hair care and skin care products), textile processing, industrial cleaning, and others. Personal care is a major application for surfactants, as they are one of the important ingredients required in skin care, hair care, ointments, gels, creams, and other cosmetic products. The industry is growing rapidly as personal care products have high demand among customers. The increase in spending on better personal care products is driving the surfactants market. Also, the retail sector is getting organized in emerging economies such as China, India, and Brazil which is also helping personal care industry to flourish. The industry is continuously evolving to comply with changing consumer preferences. Earlier soaps and shampoos were the major application areas of surfactants in this industry. However, the use of surfactants in various cosmetic products such as cold creams and lotions is also gaining momentum, thus driving the market. The growing focus on “green chemistry” by many companies to meet the demand for eco-friendly products from consumers has taken the personal care industry to a new dimension. These factors positively influence the use of surfactants in the industry. This research study involves extensive use of secondary sources, directories, and databases (such as Hoovers, Bloomberg BusinessWeek, and Factiva) to identify and collect information useful for this technical, market-oriented, and commercial study of the surfactants market. The primary sources mainly include several industry experts from core and related industries and preferred suppliers, manufacturers, distributors, service providers, and organizations related to all segments of the industry’s supply chain. After arriving at the overall market size, the total market has been split into several segments and subsegments. 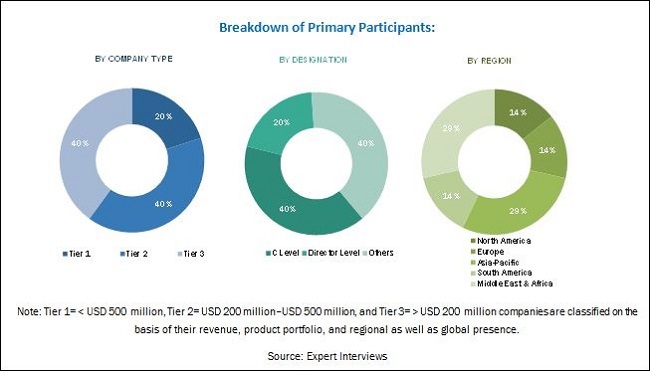 The figure below illustrates the breakdown of the primary interviews based on company type, designation, and region conducted during the research study. The key manufacturers in the surfactants market include Akzo Nobel N.V. (The Netherlands), Air Products and Chemicals (U.S.), BASF SE (Germany), Clariant AG (Switzerland), E. I. DuPont de Nemours & Co (U.S.), and others which manufacture different types of surfactants. Synthetic surfactants are synthesized from petroleum products, whereas bio-based surfactants use biological or renewable substrates as their raw materials for synthesis. Raw substrates (such as vegetable oils & oil wastes, polyglycerol & carbohydrate fatty acid esters sugar alcohols, and starchy substrates) and industrial wastes (such as dairy industry whey, animal fats, and molasses) are the major substrates that are or can be used for production of bio-based substrates. Traditionally, surfactants are synthesized from petroleum-based products, using chemical processes that make use of high temperature, and involve high acidity or alkalinity with organic solvents. In July 2016, Clariant AG (Switzerland) introduced a wide range of specialty surfactants such as Genaminox, Hostapon, Hostagel, and Glucopure for the Indian market. In April 2016, AkzoNobel N.V. (Netherlands) The company signed a letter of intent with Atul Limited (India) for exploring the feasibility to produce monochloroacetic acid (MCA) at Atul Limited's facility in Gujarat by forming a manufacturing joint venture. In May 2015, Kao Corporation (Japan) The company completed constructing a production plant in Shanghai with an investment of USD 41 million. This plant boosted the company's production base in China. Surfactants supplied by the company are used in detergents, shampoos, and functional chemical products for industries. This report categorizes the global market of surfactants on the basis of type, substrate, application, and region. What new products companies are exploring? What role will greener surfactants play in market in the long-term? The surfactants market is estimated to reach USD 39.86 billion, by 2021, from USD 30.64 billion in 2016, at a CAGR of 5.4%, between 2016 and 2021. Surfactants are surface active ingredients which reduce the surface tension of liquid. When surfactants are added in a liquid, it increases its wetting and spreading properties. In dyeing of textiles, surfactants help the dye to penetrate the fabric evenly. Surfactants are also used to disperse aqueous suspensions of insoluble dyes and perfumes. Surfactants find application in various segments ranging from personal usage to industrial applications. The growth of the surfactants market is primarily triggered by the rising demand from the personal care segment. Surfactants are widely used in detergents, cleaners, soaps, and shampoos other related products for removing dirt, oil, stains, and various unwanted foreign particles from the surface they are applied to. Surfactants are classified on the basis of type into anionic, cationic, nonionic, and amphoteric. Anionic surfactants account for the majority of the market share while nonionic surfactants are witnessing more demand from various applications owing to their low foaming and better emulsifying properties. Amphoteric surfactants are used in detergents, shampoos, and other personal care products and account for a smaller market share. Cationic surfactants are expensive and have a smaller market share in terms of volume than anionic and nonionic types. On the basis of substrate, surfactants are classified into synthetic and bio-based. Synthetic surfactants are derived from crude oil, whereas, bio-based surfactants are produced from natural sources such as palm oil and animal fats. The demand for bio-based surfactants is increasing due to strict environmental regulations which favor the use of bio-based surfactants. On the basis of applications, the surfactants market is segmented into detergent, personal care, textile, industry & institutional cleaning, elastomers & plastics, oilfield chemicals, crop protection, food & beverage, and others. The demand for surfactants is expected to witness the highest growth in personal care application owing to their increasing use in cosmetics and personal care products (skincare, hair care, baby care, and others). Thus, the demand for high-quality and high-performance products in the personal care industry is estimated to drive the surfactants market. Asia-Pacific is the largest market for surfactants owing to the rising demand from household and industrial applications. The surfactants market will be driven by the demand from rising population in countries such as India, China, Indonesia, and others. The retail industry is also getting organized in these countries, and the disposable income is also rising, which will boost demand for better quality consumer goods. Detergents used in household applications include laundry detergents, soaps, dishwasher detergents, carpet cleaners, and various types of fabric softeners. Surfactants in detergents help remove oil, dirt, and unwanted particles from fabrics, dishes, and other surfaces. Surfactants not only remove the dirt and unwanted particles but also keep them suspended during washing, resulting in a cleaner surface. Surfactants are mainly used in the soap & detergents industry due to their properties such as surface tension reduction, emulsion, and dispersion. Surfactants are mainly used in cosmetics, skin care, hair care, and other personal care products. Consumer awareness regarding the use of eco-friendly products is rising. Hence, the demand for products made from natural sources is increasing. The key growth segments include baby care, hair care, and skin care products. Disposable wipes is another growing product segment with small volume but increasing demand. The textile industry uses a variety of chemicals, mostly surface active agents, for processing textile fibers to produce fabric. Surfactants are used in the textile industry in a variety of processes. They are used in the removal of oil and dirt from natural fibers to prepare fiber for spinning. Surfactants are also used for fabric softening, even distribution of dyes, and to increase the water repellent property of the fabric. Ethoxylates, fatty alcohol ethoxylate, fatty acid ethoxylate, and fatty amines ethoxylate are the major surfactants used in the textile industry. Which applications would drive the major growth of surfactants market? What role will the government regulations play in the market? Surfactants can cause environmental and health concerns. Therefore, various regulations are imposed by government agencies such as United States Environmental Protection Agency (USEPA) and Registration, Evaluation, Authorization, and Restriction of Chemicals (REACH) to address them. These agencies map and monitor the toxicity levels to keep it within the permissible level. The global surfactants market is dominated by various players, such as Akzo Nobel N.V. (Netherlands), Stepan Company (U.S.), BASF SE (Germany), Clariant AG (Switzerland), Air Products and Chemicals, Inc. (U.S.), and E. I. du Pont de Nemours and Company (U.S), among others. The leading players mainly concentrate on new product development to enhance their market reach and make innovative products available to a large number of customers. Thus, to gain competitive advantage, companies are coming up with better performance surfactants. 12.2 Air Products and Chemicals, Inc.
12.5 E. I. Du Pont De Nemours & Co.